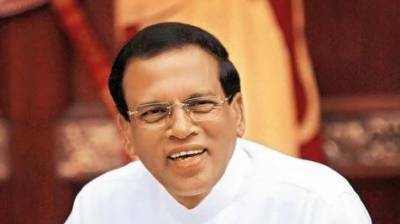 Colombo (Agencies): Sri Lanka’s president has summoned Parliament to meet next week as pressure grows for him to resolve the turmoil set off when he sacked the Cabinet last week, his chosen prime minister said Thursday. Sirisena had replaced him with former strongman Mahinda Rajapaksa and suspended Parliament until Nov. 16 in an apparent attempt to give Rajapaksa time to muster enough support to survive any no-confidence vote. Sirisena’s moves have triggered a power struggle and some observers call it a constitutional crisis. Karu Paranavithana, a lawmaker from Wickremesinghe’s United National Front, welcomed the announcement, calling it “a great victory” for the people. He said Sirisena’s coalition tried to establish a dictatorship but failed. “They will have to retreat now,” he said. Sirisena’s supporters have talked for weeks about an alleged assassination plot, but Sunday was the first time Sirisena commented publicly about it. A police informant has said Wickremesinghe and a Cabinet member, former army commander Sarath Fonseka, were behind it. Police have made no arrests. Tensions have been building between Sirisena and Wickremesinghe for some time, as the president did not approve of economic reforms introduced by the prime minister. Sirisena was also critical of investigations into military personnel accused of human rights violations during Sri Lanka’s long civil war, which ended in 2009. A shooting at the Petroleum Ministry on Saturday killed two people and wounded one in the first violence related to the turmoil. On Tuesday, thousands of Sri Lankans protested in the capital demanding Sirisena immediately convene Parliament. Separately on Thursday, Sirisena swore in two Cabinet ministers, five state ministers and six deputy ministers, as a part of the new Cabinet which is still being formed. On Monday, he appointed 12 Cabinet ministers, one state minister and a deputy minister.